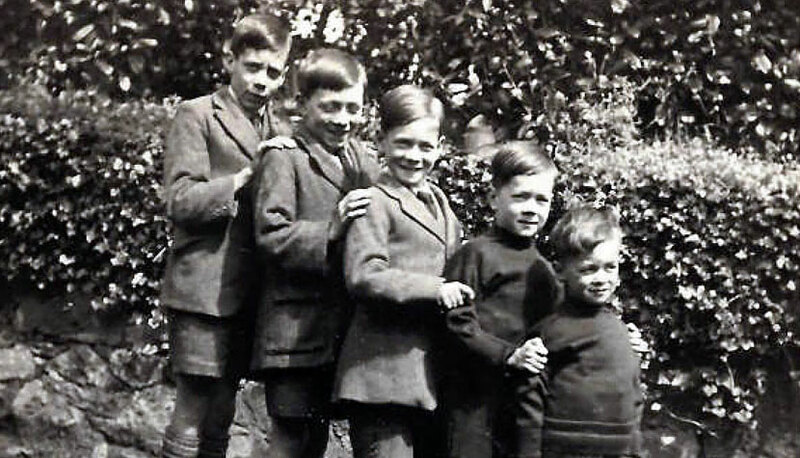 This 1920s photo was taken in Scotland, years before the five young McIntosh brothers moved to Canada in 1936. They include (from left) Don, Bob, John (Jock), Al and Jim. Al passed away in Penticton in July 2015 at age 94. The brothers will have their names associated with a patient room in the new tower at Penticton Regional Hospital. Alister McIntosh and his four brothers were all born in the village of Mintlaw, Scotland. Now they’re being memorialized through a $30,000 donation for Penticton Regional Hospital – the same location where Alister worked for a decade at the end of his varied career. Alister was born in 1921 – the second youngest child of Robert and Harriet McIntosh. His brothers were Donald, Robert Jr., John and James. However, their mother died in 1926 when Alister was just five years old. A young local woman, Agnes Smith came to care for the boys and became like a second mother to them. Their father, the village baker, died seven years later. Alister’s uncle served as a marine engineer with P&O Shipping Lines and upon his retirement, immigrated to Canada and opened a steam laundry and dry cleaning plant in Penticton. Alister’s older brother Robert Jr. later moved to the Okanagan to help with the business. After their uncle passed away, the rest of the family decided to immigrate to Canada as well. Alister said in a family bio. About two weeks later, they arrived in Penticton. While the three oldest boys worked at the laundry, Alister and his younger brother James attended Penticton High School. After graduating in 1939, Alister worked in the dry cleaning part of the family business before enlisting in the Royal Canadian Air Force during World War Two. Alister was posted to Yarmouth, NS to join an RCAF squadron hunting submarines in the Bay of Fundy and Gulf of St. Lawrence. In 1943, he was posted overseas to England. After his discharge from the RCAF, Alister found work on board the CPR tug Naramata (now moored in Penticton next to the landmark sternwheeler SS Sicamous). As a stoker, he earned the princely sum of $99 a month. “Boxcars were transported by barge, loads varying from manure from the Calgary stockyards to fruit,” he recalled. Alister soon returned to the dry cleaning business in Summerland, where he met and married Doreen Howard in 1948. He later worked at the former Northwood Mills lumber mill in Penticton from 1972 until its closure in 1977. He then accepted a job as engineer at Kelowna General Hospital and later was offered a similar position at Penticton Regional Hospital, where he remained until his retirement in the late 1980s. Doreen passed away in 2013 after a short battle with cancer and Alister died on July 6, 2015 at age 94. They are survived by daughters Linda, who lives in Summerland and Sherri of Kelowna. The McIntosh brothers were thankful and proud to be Canadians and considered the Penticton area “home.” The donation to the South Okanagan Similkameen Medical Foundation’s PRH equipment campaign signifies their gratitude. Construction of the hospital’s new six-storey patient care tower is well underway and should be ready for patients by April 2019.